The BM240 is an affordable monitor designed for editorial and broadcast operations that require an accurate and stable display with a full complement of professional features and capabilities. This lightweight 23.8" Multi-Format broadcast monitor comes with 3G/Dual-Link/HD/SD-SDI, Component, Composite, & DVI-I Inputs. 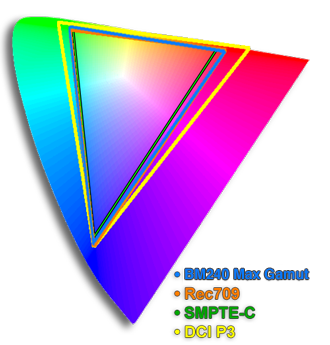 Like all BM series monitors this unit features full 12-bit video processing and a native 1920x1080 resolution 8-bit panel capable of reproducing over 16.7 million colors on screen. The BM240 offers support for virtually any signal format from NTSC/PAL to HD and 2K, including advanced 12-bit, 4:4:4, and XYZ signal formats. FSI Monitors come with a standard 2 year parts and labor warranty. International orders (any orders shipping outside of the US) are generally subject to local import duties and taxes. For more information on International Shipping see our Help/FAQ. Visit www.FlandersScientific.com for more information on BM240 features.